When the soloist was sitting down on Saturday night, I said to my concert companion, “He looks strong enough to break the piano!” The soloist in question was Denis Matsuev and I would not be surprised to learn that he was also a judoka on the Russian Olympic Team. So considering pure physicality, we knew we were in strong hands to perform what many claim to be the most demanding of all piano concertos, Rachmaninov’s 3rd. This piece includes many forceful passages with the piano and orchestra playing simultaneously, as well as a number of dialogues between piano and orchestra sections, especially the brass. You simply won’t hear the piano most of the time unless it is played vigorously. Also much of the piano’s work is set at a very fast pace. The whole thing has the serious potential of flying apart in all directions. But all the drama was under masterful control here. 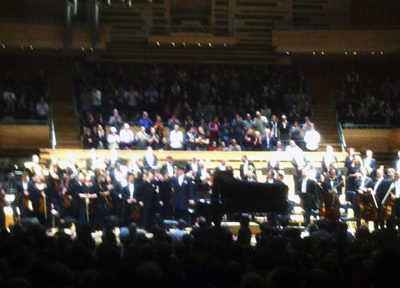 Of course it helped that the guest conductor leading the Orchestre symphonique de Montréal was Mikhail Pletnev, himself one of the world’s top pianists who has performed the same piece internationally. Talk about conductor and soloist being on the same page! The two worked together as one with such terrific back and forth between soloist and orchestra that the effect was simply overwhelming. It would be really inappropriate to single any one part out since this was artistry at the highest level from start to finish. At the conclusion there was a huge uproar of applause from the packed house, and the soloist was called back about six or seven times and then rewarded us with two encores. A collective Wow! Before the intermission we heard a now rarely performed work by Glazunov, The Seasons. This was composed for the ballet, and in several places you can readily imagine the dancers bowing or leaping. Glazunov understood extremely well the requirements of that art form, and the musical voyage we took from season to season was a very pleasant 38 or so minutes indeed. The OSM musicians played with careful precision and responded immediately to the conductor’s restrained direction, whether in quiet passages or in the wonderful climaxes. It was a pleasure to see this Russian’s style of directing. For example, while some North American maestros might be flailing dramatically to get the “dance” out of the band, Maestro Pletnev would almost nonchalantly raise and lower a shoulder, then do the same with the other one, and again back and forth a few times, to get the desired result. Too bad the concert was not recorded for posterity. Let’s hope the team of Pletnev and Matusev come back soon.